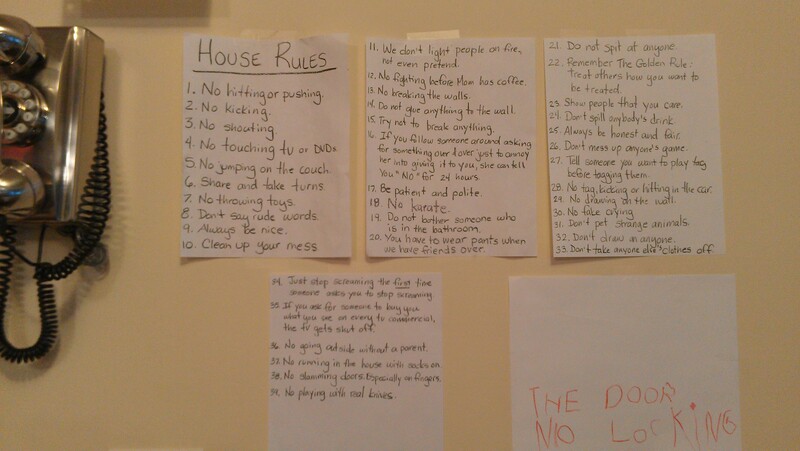 We have similar rules in our house. They also include no sparkly makeup to kindergarten, if you have to cry please go in your room, no arguing about who is the oldest, youngest, or whose mommy I am. No stealing mommys diet coke. Why do they argue about who’s bigger? We can all see who is actually, physically bigger. Why are we fighting about this? Jen recently posted..Playing with your food: When poultry attacks! 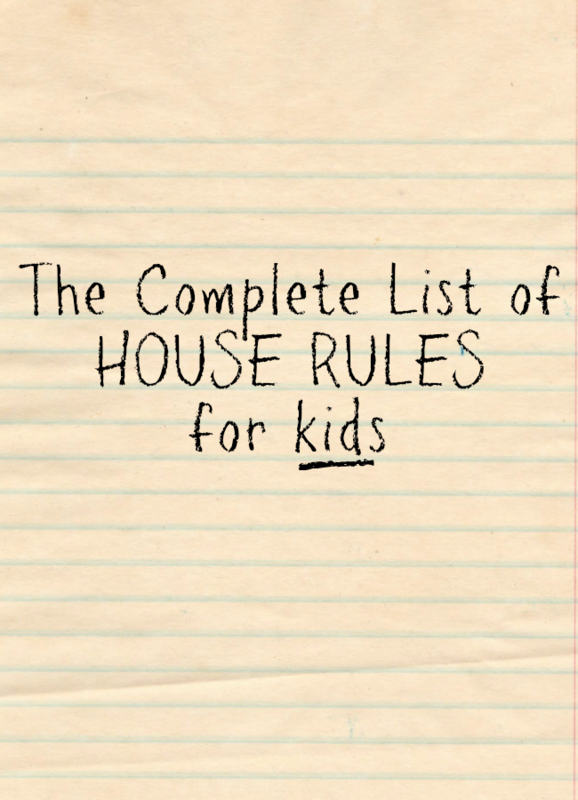 As it is 9am and my daughter is currently FAKE crying upstairs because her brother wants to play alone after waking her up early because he was bored, we need the rules here of: No waking anyone else up extra early in the morning, especially on a Saturday! and No telling someone you want to play with them, only to then run to your room and decide you want to play alone and slam the door in their face. Fake crying puts me over the edge. no answering the door without permission & no barking, growling, or any loud animal noises while mommys on the phone! Your head is not just for decoration, use it! You can’t go back in, stay out from between my legs! 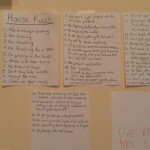 omg..#16 ..this list is heaven sent! We’ve recently added “No Buying Turtles Online.” The kids are 15, 13, 7, and 5, and were left alone while I went to buy milk. 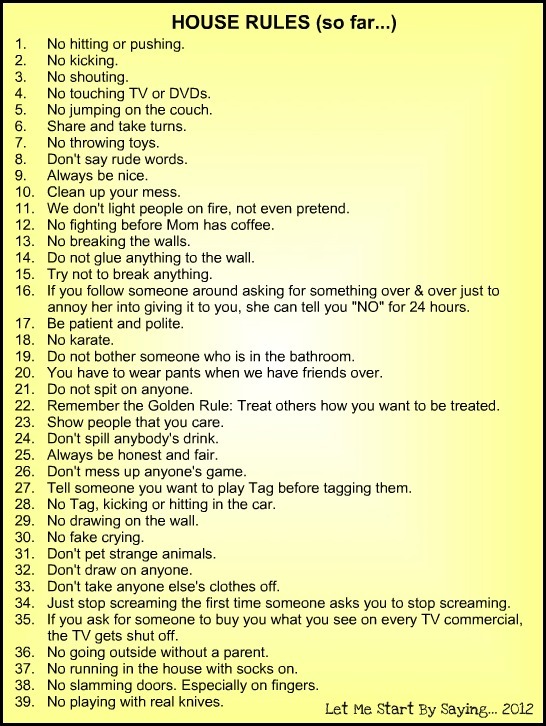 WAAAAAY to many rules, “no this no that , no no no NO NO!” yikes. Let them breathe. Let them think for themselves, or is that one of your rules too??? “NO Thinking unless I tell you what to think” HAHA.